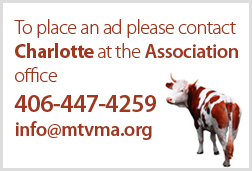 MVMA Members may post job openings on this page at no charge by emailing Charlotte: [email protected]. The posting will remain up for 3 months. Please click here for non-member pricing. Ark Veterinary Practice is a busy mixed animal and exotic practice in the Gallatin Valley. We are a fully equipped hospital with an in-house lab, digital full body and dental radiology, ultrasound and video otoscopy. We practice high quality medicine and surgery and are looking for an additional team member to join the medical care team. The ideal candidate would be looking for full time permanent employment and would be certified or equivalent, although non-credentialed and part time applicants will be considered. We are hoping to find a compassionate, hard working and gifted team player who is committed to excellent patient care and customer service. Experience with AVImark, pharmacy work and inventory management would be of benefit. We give our technicians broad opportunities to practice and perfect their skills on a daily basis. We are flexible with schedules and days off as we recognize that a healthy work life balance is important for all members of our care team. Pay DOE. Please send your confidential resume with a cover letter and references to: [email protected]. Please email resume with references to [email protected]. We are looking for a self-motivated individual who can work well with our team and use their skills to provide outstanding medical and surgical care for our patients. Strong work ethic, communication and organizational skills, as well as strong technical skills caring for surgical and hospitalized patients are a must. Dillon, Beaverhead County and Southwest Montana offer unlimited outdoor recreation opportunities. We are an enjoyable small town community (e.g. no traffic and affordable housing), to include University of Montana Western, near the confluence of great rivers, nearby mountains, lakes and abundant wildlife. Red Lodge Veterinary Clinic, located in the beautiful mountain town of Red Lodge, is seeking a personable, organized, patient-focused and reliable veterinary assistant/technician. Experience working in the veterinary industry is an asset. This job will include working directly with our doctor and technicians to provide exceptional patient care, client service and upkeep of the practice. The candidate must be comfortable working around large and small animals, be able to communicate professionally with clients and co-workers, be a team player and multi-task efficiently. Our focus is to provide exceptional client and patient care. Rocky Mountain Reproductive Services is a bovine embryos transfer company that is based in Billings, MT. We preform embryos collections, transfer and cryopreservation. We travel in a 2-3 person team and service clients in Montana, North Dakota, South Dakota and Wyoming. We are currently look for qualified, energetic individuals to join our professional team. Seasonal (April through July) part-time and full-time positions are available which can become full time positions for somebody that works well with the team. The individual will assist in embryo collection, thawing embryos for transfer, record keeping, data entry, preparation and cleaning of mobile lab, safely drive a pickup truck with trailer, and communicate effectively between team and clients. Interested individual please send a resume and references to Dr. Michael E Wehrman at [email protected] and/or call 406.581.6685. Email [email protected] or call Michelle at 406-245-4772 for more information! We look forward to hearing from you! Come join our team!